I hear it nearly everywhere from nearly everyone. At school, at dance, and while texting my friends, the same complaint resounds: “I stayed up until one AM last night studying, I have three tests to study for, two papers to write, and even more homework!” Now, I’ve definitely been guilty of complaining about my four quizzes all on the same day. While I have been lucky to not be buried alive in homework during the first two months of school (huge thanks to all of my teachers- keep up the good work, please), I still feel like I’m doing something wrong. Why are all of my friends so stressed about their work but not me? Does my lack of stress mean that I’m failing as a student? Turns out, what I’ve been feeling is the result of the stress culture at Newton North. The phenomenon has been affecting more and more schools across the country. 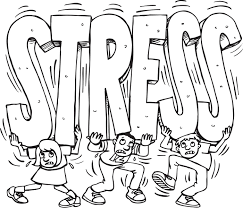 Stress culture is the culmination of cripplingly high expectations during the confusing, anxiety-provoking teenage and young adult years. While I acknowledge that not everyone at North is affected by stress culture, it still exists and affects the school’s environment drastically. I hear kids who like to brag about how much of their weekend they spent writing their history essay and see signs at club day advertise “looks good on college apps” as their selling points. Much of what’s causing students’ stress is the expectation for teenagers to be high achieving. In the Newton community, it can be especially competitive with the emphasis placed on college admissions, which the majority of Newton students choose to take part in. If it’s not your parents pressuring you, it’s your teachers, and if it’s not your teachers, it’s a friend or a friend’s parent. But, there are many steps the Newton North community can take to change this. One thing I have found very helpful to me is the support of my teachers. This year, I’ve noticed that some have taken the time to assure kids that “grades don’t define your worth as a person” and “there is more to this class than just your grade”. This can feel very cheesy and repetitive, it’s important to acknowledge and reestablish school as a place to learn, grow, and discuss ideas with each other- not mindlessly work on assignments in order to get a number on a transcript. Additionally, given the school administration’s supposed emphasis on balancing workload, there is very little reinforcement of this. For example, while the school recommends that students take no more than three honors or AP courses in a school year, there is no actual impediment to this other than an email sent home that literally everyone ignores. There is definitely more that needs to be discussed to ensure each student in the building isn’t consistently overwhelmed and sleep-deprived. The Newton North administration needs to take student stress and mental health more seriously. High stress and high achieving districts such as Newton have been proven to have more kids who deal with mental illness. Given that about one in five 13 to 18 year olds will experience mental illness in their lifetime, it is shocking that a school like North with many resources does not seem to prioritize mental health over academics and extracurriculars, nor does it even explicitly mention mental health in their PEHW curriculum. If Newton North takes the steps to have real conversations with students, families, and faculty, we will see a community that is considerably happier, healthier, and more connected.